The Elstead Medstead exterior flush half wall lantern in black finish and rated IP43 is traditional, with three clear glass panels and classic style. Supplied with a manufacturer five year anti corrosion warranty. This traditional lantern shaped cast aluminium exterior wall light is shown with a reproduction Edison period light bulb to complete the antique look. These light bulbs are available to purchase separately from our website. 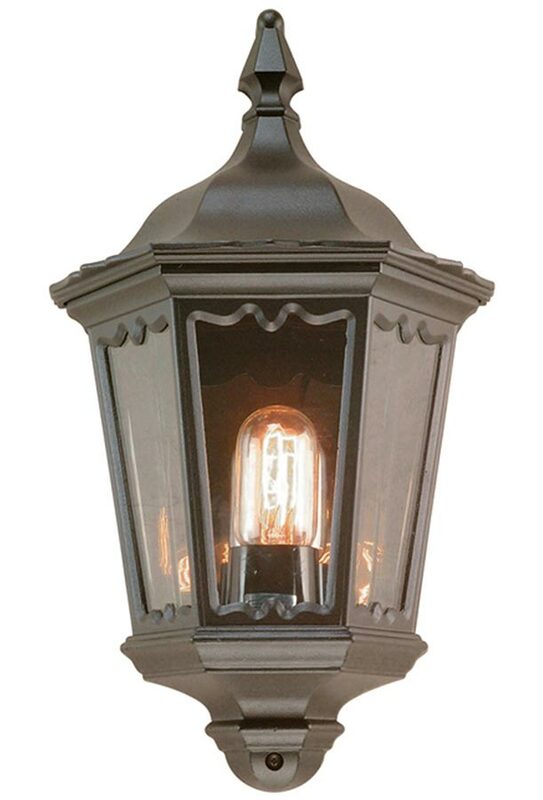 There is a matching wall lantern with PIR in the Medstead outdoor range; please see below. This outside light is supplied by Elstead Lighting, a British company that specialise in the manufacture and distribution of quality decorative lighting such as the Medstead exterior flush half wall lantern in black finish and rated IP43 you see here.